Confederation of African Football president Issa Hayatou has admitted he expects an "imperfect" hosting of the 2015 Africa Cup of Nations. Equatorial Guinea have only weeks to prepare for the 17 January to 8 February tournament after replacing original hosts Morocco on 14 November. 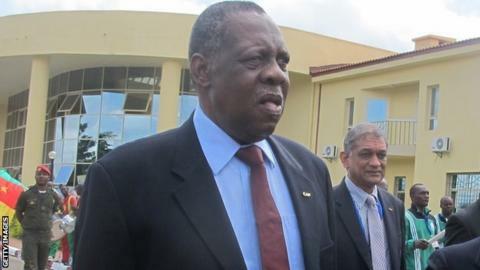 Hayatou told BBC Sport: "If I say there will be no problems, I would be lying. "In two months we can't bring together everything that is needed without there being some imperfections." Hayatou revealed he has concerns over "catering, accommodation, internal transport, international transport and media" but added: "We'll do everything so we can save the essentials." Matches will be held in Bata, Ebebiyin, Mongomo and the capital Malabo. In 2012, only Malabo and Bata were used. Equatorial Guinea stepped in as hosts after Caf rejected Morocco's request to postpone the tournament - a plea made because of the country's fears over the potential spread of the Ebola virus. Up to 24 November, at least 5,490 people had been reported as having died from Ebola, mainly in the West African countries of Sierra Leone, Liberia and Guinea. But Hayatou believes there will be no threat to players' safety at the finals and even suggested those who are worried could decide not to participate. "If a player is contaminated, he will not get into Equatorial Guinea," he said. "There has not been one single case of Ebola in Equatorial Guinea, why are they scared? They shouldn't be scared. "We are not irresponsible. Even us at Caf, we're human beings. Do you think we at Caf would be there if there was Ebola? "So I say to the African players, there's no obligation to come and play. If they don't want to come then that's a matter for their country's football federation." Relocating the tournament to Equatorial Guinea - who co-hosted with Gabon in 2012 - has also sparked football-related controversy. The country's national team were penalised for fielding an ineligible player in qualifying, which led to their elimination, but they have been reinstated as hosts. "They came to our rescue. If you were in our place what would you do? Organise a tournament without the host nation? It's never happened," said Hayatou. "So we had to call on their national team to complete the 16-team line-up. They came to our rescue so it's perfectly normal that their national team is part of this tournament." The draw for the finals will be held in Malabo on 3 December.